I couldn’t quite believe it when I had a friend of mine tell me that he really believed that $10 per gallon gasoline would be a good thing. He actually wanted the U.S. to face a recession similar to the one that Japan faced in the 1990’s. Apparently my friend’s sentiments weren’t all that unusual. In this video, Barack Obama supporters at a MoveOn.org rally readily admit that they want gasoline to cost $10, $20, even $30 per gallon. When asked how this would affect a single mom with a minivan, their response was, “she shouldn’t be driving a minivan”. These are the types of people that will be in an Obama administration. For those of you on the fence, keep this in mind! Don’t think that the “progressive” agenda won’t amount to outrageous energy costs. They just want you to sit there and sweat in your hot, dark house all in the name of global warming. South Dakota residents should be proud of themselves. In a time when Washington, D.C. offers no solutions and double-talking politicians complain about gas prices while blocking any effort to drill domestically, South Dakota comes through with a solution. Build a big new refinery and force more domestic drilling! Now, nothing has happened yet and the enviro-wackos have yet to swoop in and conveniently find some endangered field mouse in Union County, but 3,292 acres have been rezoned to build the nation’s first new oil refinery since 1976. That’s right. The environmental movement has been successful in blocking any new domestic refineries for that long. Can anyone say high gas prices? The same people that complain that we need to wean this country off foreign oil are the same ones that block any effort to drill. Just where are we supposed to get our oil from? NOWHERE! That is the million dollar answer. We aren’t supposed to get oil….we’re supposed to slink back to the days of cart and buggy and the wild west. People who oppose domestic drilling (i.e Democrats) aren’t interested in real solutions and block any effort to fix our problems. What would drilling for domestic oil do? It would have an immediate impact in that it would send a message to OPEC nations that we are tired of the prices and we can get our own oil. Right now, we’re completely at the mercy of them. If we start drilling, those same nations aren’t going to want to lose our business. Prices will fall, while great companies like General Motors and Ford will continue to develop technologies that will utilize gas better than it is now. However, these things take time and there is clear public support for new types of energy. So, congratulations to South Dakota for coming up with a solution to high gas prices, rather than playing politics and just complaining about the problem. If you’re interested in sending a message to Washington to start drilling now, Newt Gingrich has championed an effort to get them to start. Click here if you’re interested. Exxon Mobil reported this week that it set an all time new record— not in earnings or profit, but in income taxes paid to the government in a single quarter. 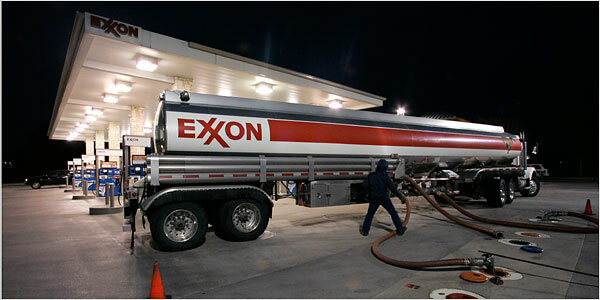 Exxon Mobil paid $9.32 billion in income taxes in the first quarter of 2008 alone, which is a record for U.S. corporate taxes. Profit was $10.89 billion, which was the second highest ever for a U.S. corporation in one quarter. Total overall tax burden for Exxon Mobil this quarter was $29.3 billion if you include income taxes, sales taxes, and “other” taxes, which turns out to be a 25% total tax rate when you examine total revenue ($116.85 billion). Taxes paid by Exxon Mobil was nearly triple what they made in profit. With oil prices and gas prices through the roof, this warrants some examination. If you haven’t already noticed, the discussion of corporate taxes is an acute political issue. On one side, you have the Republicans, who are for tax cuts for pretty much everyone (including businesses). On the other side, you have Democrats who claim they want tax cuts for the poor and want to stick it to businesses (like Exxon Mobil) and the “rich”. While “tax cuts for the rich” tugs at the heart-strings of every person with wealth envy in this country, it doesn’t really make much sense in the end. Who are the “rich” in this country? They are the small business owners, the big purchasers, and the people who employ the rest of us. What sense does it make sticking it to them? When the so-called “rich” get nailed by taxes, they make cut backs like the rest of us. They hire fewer people and they don’t buy as many nice things. Jobs and retail sales suffer and the economy slows down. As for corporate taxes, here is the big myth debunked: Corporations don’t pay taxes! They don’t now and they never will. Corporations COLLECT taxes only. When a corporation is taxed, the corporation figures it into the cost of goods sold and it is passed onto the consumer. Only the consumer pays taxes. That’s how it is now and that’s how it will always be. Every business, including oil companies, does this. This is a stealth tax on consumers. By some estimates, this stealth tax averages out to 22% on everything we purchase. On gas purchased from Exxon Mobil and other American oil companies, it’s more like 25%. That’s 25% of every gallon going right to the federal government. “The profits right now are so remarkable that one could trim them 10 percent or so, which would turn out to be somewhere in the $15 billion range,” said Jason Grumet, an adviser to the Obama campaign. Oil companies would still have ample reason to “continue to pursue production, while at the same time providing relief to consumers,” Grumet said. Relief to consumers? Are you kidding? How does raising taxes on oil companies by $15 billion provide relief to consumers? Does Mr. Grumet honestly believe that gas prices are going to fall after the government confiscates more money from oil companies? Of course not, this $15 billion is going to show up right at the gas pump when the national price of gas jumps an additional 15-20 cents a gallon. See the twisted logic of liberals? There is a giant disconnect between liberals and basic economics. Yet, it gets them votes on election day because of the ignorance of the public. The myth of corporate taxes continues to prevail among the masses and people think that by taxing oil companies that somehow it doesn’t affect them. It does, and it is probably one of the most devious methods our government uses to tax us–the stealth tax.